Abit IT7-MAX2 v2.0 PCSTATS Review - Is the IT7 MAX2 Rev2 Fast? Is the IT7 MAX2 Rev2 Fast? After hearing stories about the ability to overclock this board, not to mention the top runners on FutureMark ORB, I was ready to see some high results. Unfortunately the Pentium4 2.8 GHz processor we test with was only able to reach 147 MHz FSB. Nuts to that, I swapped out the 2.8 GHz chip with a Pentium4 1.6A (SL668 Malay) and started to raise the FSB as fast as I could. The highest I was able to reach with stock cooling on the IT7 MAX2 Rev2 was 178 MHz FSB while maintaining 100% stability. Very impressive to say the least. Abit has always given tweakers full control of their systems and the IT7 MAX2 Rev2 is a prime example of that. We see all the usual memory tweaks we would expect from a high performance motherboard. 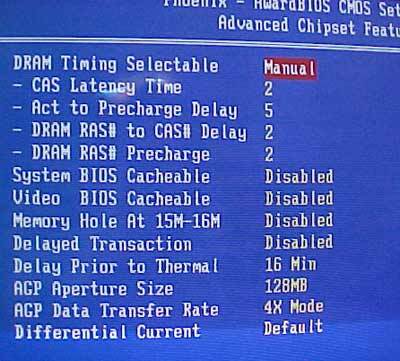 There's CAS Latency adjustments, RAS To CAS delay, Act to Precharge Delay and so on. We can also change the AGP Aperture size and its transfer rate here. Ahh, good ole Soft Menu III. This is where the overclocker will play most, we can change the FSB from 100-250 MHz in 1 MHz increments, Abit gives us a 1/3 and 1/4th PCI divider as well as being able to set them to run at 33/37/44 MHz. 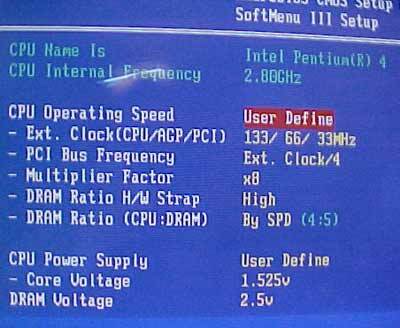 Multiplier control is only for those who have unlocked Pentium4's. We have a whole load of memory frequency options from 1:1, 4:5 and 3:4. With the official Abit BIOS's CPU voltage goes as high as 1.85V and the DRAM voltage can be raised to 2.8V. Pg 3. — Is the IT7 MAX2 Rev2 Fast?